This is How PepsiCo Helps People Lead Healthier Lives? >When it comes to justifying its partners, the Academy of Nutrition and Dietetics likes to point to companies’ collaborative spirits and commitment to nutrition. We are unsure how PepsiCo empowers members to be food and nutrition leaders? If the answer is “they hire RDs,” then the same can be said for any institution or company that has RDs on staff. How does PepsiCo empower AND members more than a hospital, a WIC clinic, or a dialysis center? Very well. PepsiCo likes to point to its Quaker product line to show its alleged commitment to wellness. 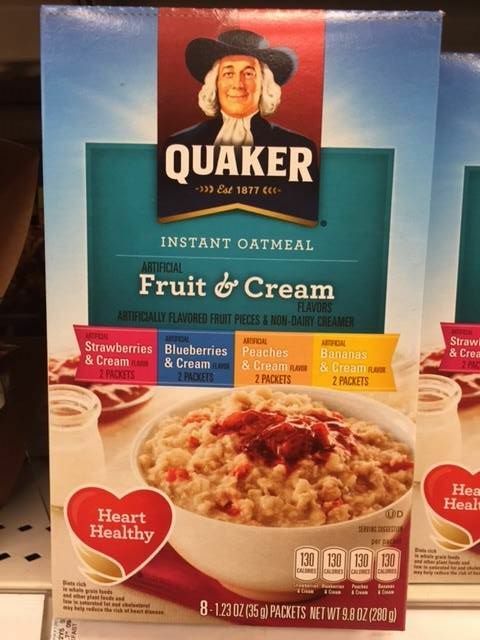 The above photograph shows a Quaker product with a “heart healthy” claim on the front of its packaging. Yet, three of these varieties list partially hydrogenated oils on their ingredient lists. Additionally, Quaker’s only product intended for children — “Dinosaur Eggs” instant oatmeal — also contains partially hydrogenated oils along with five artificial dyes (along with a tablespoon of added sugar). Is it too much to ask that a company that partners with a health organization not contribute to Americans’ intake of artificial trans fats?